Although my personal situation is far from being good, I want to finish my journal with a smile. I want to thank you Silvia for giving me the opportunity to receive your English classes mixed with management skills. I do appreciate it!!! On Monday I didn’t attend English class. I had to run toward home as fast as I can. My husband was a little reckless and I had to pick up him from the street. Between Thursday and Monday we visited the urgency door three times. Drugs didn’t work at home. He had pain attacks more severe and frequently than he used to. Early in the morning he told me he was fine and I attended MBA classes. But when I phoned him he told me he was in the street sitting in a park. We were waiting for an important card from INSS about his sick leave and he went to the post office to take it. In the middle of the way he needed to sit down and he phoned me. Then I left classes in a hurry! On Wednesday we started the class talking about final exam and presentations. After a little reminder we began the last topic, Leadership. Silvia talked about old theories that were oriented on the tasks or the traits and situational leaders. She also talked about the five levels of leadership. First level was the position. People follow you because you have higher position from them, in fact, because they have to. Second level was the permission. People follow you because they like you, you have influence on them. Most of the times, it occurs to managers who have emotional intelligence. I mean, they listen well and they observe and are conscious about what people do. They are servants of others. Third level was the production. People do what they see, not what you say. You have to lead yourself first and then lead by example. We hadn’t enough time to the rest levels because Silvia wants us to see two videos, one about servant leadership and other about orchestra conductors. This week Silvia started the class talking about blinking slowly. It’s a signal of our brain when is processing information. Silvia thought we weren’t paying enough attention but, as usual, there were a lot of things to talk about with the classmate beside you, not with the whole class. Anyway, we saw a video related to the game we made last week. It was a reflection about collaboration, differences between leaders and facilitators and also how to work under pressure. We saw another TEDtalk video. It was James Cameron talking about teamwork and how we can create a bond. He said it comes when there are curiosity, imagination and, the most important thing, respect you have for each other. He encouraged the audience not to put limitations on themselves and take risks. After a little discussion, Silvia asked us to create our own mantra as poem that was a way to communicate with ourselves. It was very difficult because it had to have 4 verses and they had to rime. That’s why my mantra is awful…. On Wednesday we started the class with a little discussion about how we will celebrate the end of the English classes. Some of us suggested going on a trip to London or Ireland but Colombians and Venezuelans couldn’t go. So, the best way to celebrate would be having a dinner together. We will see! We also took a Card from the Universe. Mine said “Love is the answer….” It was great because I had no question and Universe spokes. The topic we started discussing was “Empowering and Delegating”. Silvia told us Empowering people means to help them to develop a sense of self-confidence, to help them overcome feelings of powerlessness, to energize them to take action and to mobilize intrinsic motivation to accomplish a task. She also spoke about the dimensions of empowerment: 1. Self efficacy, 2. Self determination, 3. Personal consequences, 4. Meaning, 5. Trust. We talked about Michelangelo and his commitment to paint Sistine Chapel. We also discussed about what the advantages of delegation are and how we would delegate effectively. Today I have to give thanks (to God or Universe, it doesn’t matter…). The only thing I had in my mind now is the Card I took on Wednesday… My husband is getting worse. He was in bed with horrible headaches since Tuesday. Drugs didn’t work as used to. He had high temperature but he didn’t want to go to the hospital until today. But pain disappears if love is around you. 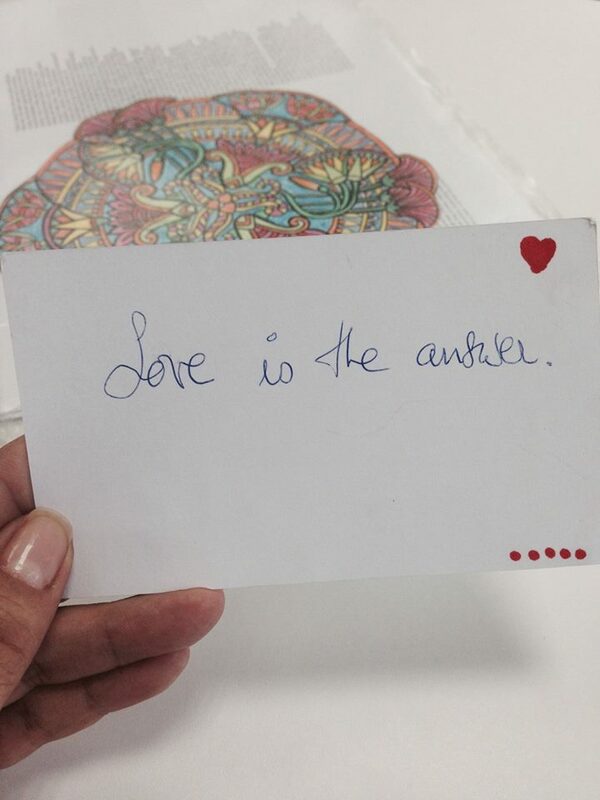 “Love is the answer….” for sure! As last Monday, Gonzalo took a Card of the Universe for me. This time I’d taken a photo. 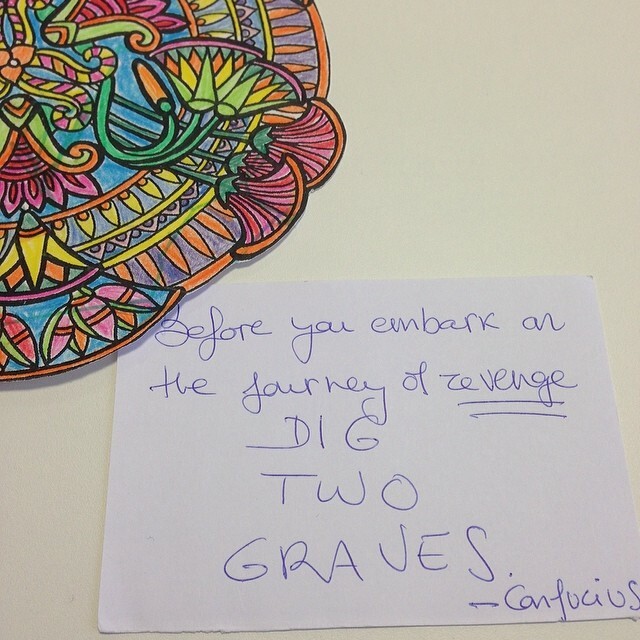 It said “Before you embark on the journey of revenge DIG TWO GRAVES – Confucius” I totally agree with Confucius, because revenge would take you to a grave! You would lose the most. So I’m not avenger at all!!! We started the new topic, Building Effective Teams, with a little discussion about what would we do when there is someone who isn’t motivated? Unfortunately there are a lot of people who has an unproductive behavior. It is a real problem in business The reasons would be the followings: 1. They consistently miss meetings, 2. Or miss details, 3. They never come prepared to meetings, 4. They don’t answer emails or messages in a reasonable time or 5. They use discourteous or disrespectful language. We worked in groups about which steps would we follow if we have this problem in our team? First of all, we would ask her/him about what are the areas / interests / tasks that she/he prefers. We would listen carefully to her/him in order to give responsibilities the most appropriate to the task she/he want to do. We would also have a meeting with the all team in order to distribute the tasks. If there were two or more people who want to do a certain task, they would share the responsibility of it. The main purpose is try to involve unmotivated people into the task and therefore into teamwork. If it didn’t work, we would explain to her/him the benefits of sharing tasks. If in this personal meeting she/he said she/he don’t want to do teamwork, then we would explain accurately the consequences. Even if this didn’t work, then we would give her/him a little task after reaching a consensus with the team. After all the presentations were been done, the discussion was very interesting. In fact, this is a real problem that we have had every single day in our jobs. I agreed with Alejandro and Helena about it doesn’t matter if someone doesn’t want to do her/his job. The teamwork is the goal and all the team takes responsibility for the job. Sometimes the reason is she/he hasn’t the knowledge or the ability, sometimes the will. On Wednesday, instead of Cards of the universe, we started with a TEDtalk video The Art of Misdirection. The discussion was related to what would we do in order to catch attention from audience? And we also reflected about smartphones and how they make us to lose a lot of opportunities. Silvia asked us about living 24 hours without them. It was funny because this day I forgot mine at home. I realized the phone was in the kitchen when we were 2 minutes from home, but I preferred not to come back and be all day without phone. In the way to the kinder garden, we (my husband and I) were talking about how was our life when we haven’t mobile phones. We remembered the way we met our friends in the corner near home, or on a park bench or even in a regular place we used to go. Well, Silvia continued the class explaining to us the ideal way to follow when one of the members of the team doesn’t contribute to the chief aim. And the steps are: 1. Work on improving the team behavior of every team member. Do it not apart. 2. Participate in the process yourself, so that you are “leading by example”. 3. Most of people are lazy by nature, so looks for what this team member enjoys the most doing. Allow her/him to contribute through that part. 4. Remember to use deadlines and clarify instructions to follow. Most of the cases come from absence of ability not only motivation. To conclude this part, Silvia told us the sweetest victories come from winning against adversities. I totally agree with you!!! 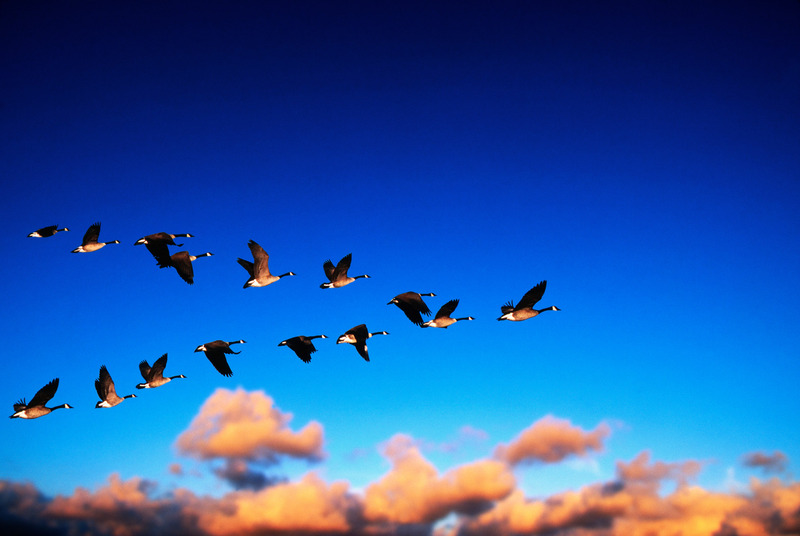 We also talked about the reasons about geese use a V pattern to fly over huge distances. It is a good example for an effective team. Silvia gave us some tips about this kind of teams and while she was speaking I wish I would be part of a good team. Even more, I wish I would be their leader. To finish the class, we played a game in groups in which we have to build a structure with spaghettis. At the top of it, a marshmallow has to be stand up for ten seconds. It was very funny. There was no winner…. We were little cheaters…. Bienvenido/@ a mi blog de Psicología!!!! Espacio para compartir reflexiones, recursos y estrategias que la Psicología nos brinda . Espero que disfrutes leyendo y compartas tus reflexiones con todos nosotros.